FREDERICK GOODHIND was born in Cullompton, Devonshire, England on August 19, 1836. On May 16, 1859, in Erith, Kent, England, he married ELIZA M. MARTIN. She was born August 22, 1836 in Dartford, Kent, the daughter of JAMES MARTIN and ELIZA TURNER. Two weeks following their marriage, they started for America aboard the ship Rhine with Frederick’s brother HENRY and his family. According to records, Frederick entered the Port of New York on June 29, 1859. He became a naturalized citizen on October 4, 1876 at Superior Court, Hampden County, Springfield, MA. Frederick was a papermaker, like his brothers, and worked at Russell, MA for several years; also at mills in Huntington, Pepperell, Middlefield and South Hadley Falls. Eventually, Frederick and Eliza lived in Unionville, CT their last 27 years. Frederick died there June 14, 1916 at the age of 79 and Eliza died on June 4, 1917 at the age of 80. 1. FRED GOODHIND was born in Russell, died very young of scarlet fever. 2. FANNY GOODHIND was born in Russell on October 10, 1860; she died on November 11, 1861 due to "congestion of the lungs. She was just over a year old." 3. 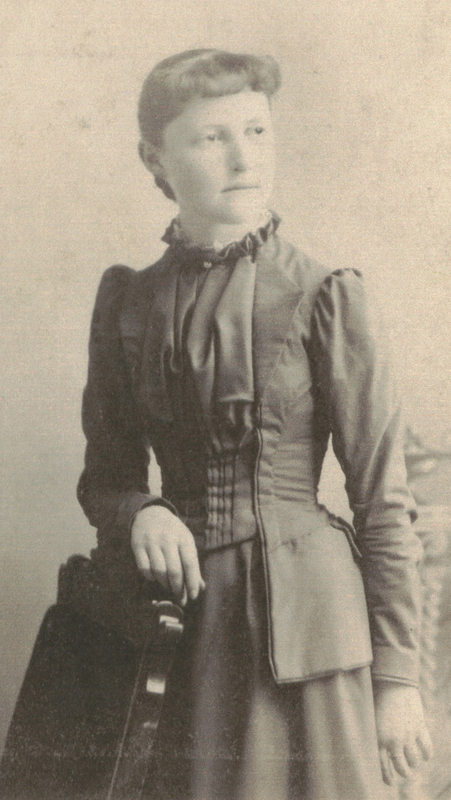 HATTIE ELIZA GOODHIND was born in Russell on August 3, 1870; she died on November 5, 1875 due to "consumption in bowels." She was just 5 years old. 4. JOHN GOODHIND (twin to CORA) was born in Huntington on October 2, 1874 and died November 27, 1874 due to "inflammation of bowels." The baby was not even 2 months old when he died. 5. 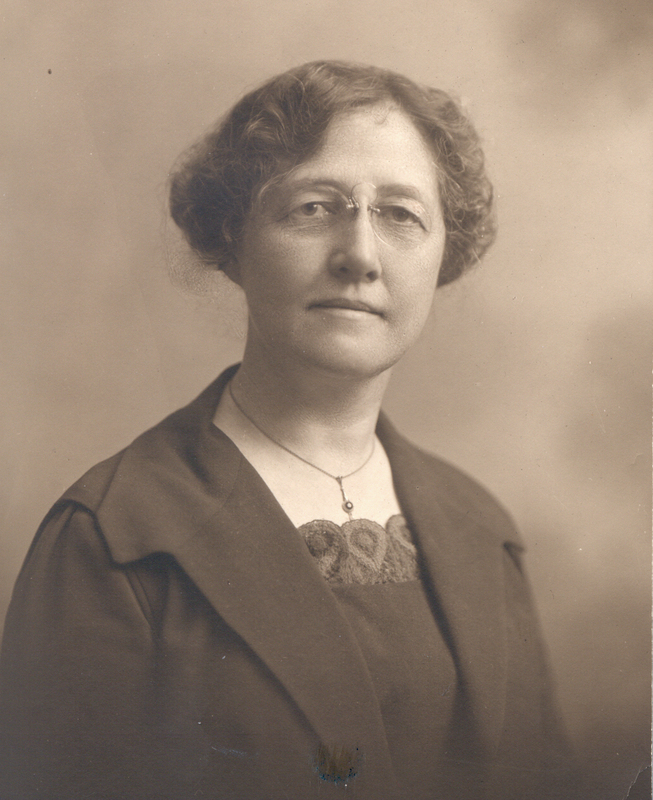 CORA MABEL GOODHIND (twin to JOHN) was born in Huntington on October 2, 1874 and died August 22, 1961. Cora was 86 years old. In 2002, I was contacted by Louanne Marinos, a descendant of the Martin family. Frederick's wife Eliza had been a Martin, as had been her sister Charlotte Martin Cook, who married Frederick's brother Richard. 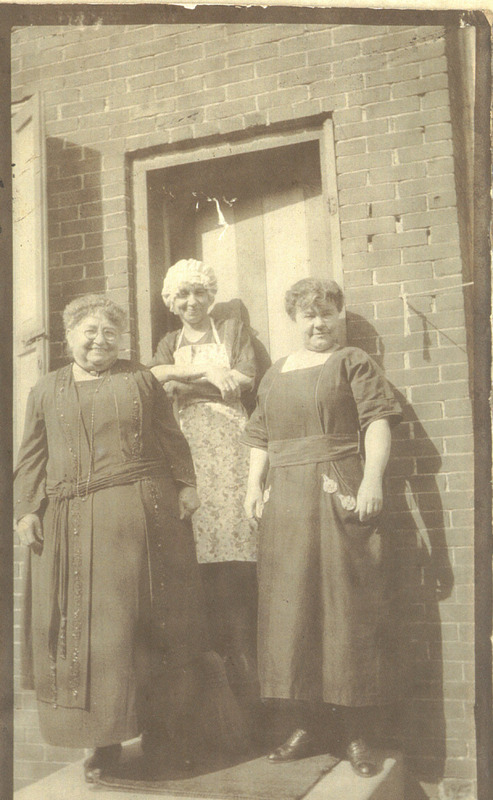 Louanne sent along information on Cora Goodhind, including the photo as a young woman at the right. In 2003, I was contacted by Mr. Cliff Alderman, a member of the Unionville, CT Museum. He had come across this website and offered information about Frederick and daughter Cora. He mentioned that there are still a few residents who remember Cora walking her cat on a leash! The photo at right sidebar is of Cora and two other ladies; she looks very much like a Goodhind. Many thanks to Cliff for his generosity! One of the amazing things that Cliff sent along was an insurance policy that Frederick submitted in July of 1893 to the Masonic Life Association of Western New York. In it are some tantalizing facts. Frederick stated that he was born August 19, 1837 and was 55 years old on his last birthday (facts disputed by records). His occupation was "Supt Paper Mill." He was 5 feet, 2 inches tall and weighed 220 pounds. He mentions that "My grandparents died in England. Cannot give exact ages, but know they lived to good ages." Regarding Intoxicating Liquors, he replies, "Total abstainer," but regarding use of Tobacco, he answers, "Smoke in moderation." Perhaps one of the most interesting parts of this application is a series of questions regarding his brothers and sisters. He writes that (by 1893), 9 are still living and 4 are deceased. He states "A Bro(ther) accidental death, the others died in infancy of Croup." He goes on to list their present ages: 62-58-53-49-47-45-43-41-39. The above gives us a direct 'snapshot' look at the Goodhind family by someone who knew them all well. Unfortunately, his accounting has a number of flaws. In 1893, Frederick at this time would have been 56 years old. He noted only 13 siblings, although we know from records that there were 14. Remaining alive at this time would have been WILLIAM (closer to 64 than 62), HENRY (58), FREDERICK himself, MARY ANN (53), RICHARD (51, not 49), MARTHA (47), TOM (45), GEORGE (43), SARAH (41) and JOHN (39). The list also implies that another sister, ELIZABETH (who would have been 37), must have passed away by 1893. But that was actually not the case: ELIZABETH survived, married and had children. This accounting brings up a speculation about the age of Richard Goodhind. According to the information above, his birth year should have been 1844, not 1842 as generally given (and as recorded on his tombstone). However, another son Thomas was born by record September 22, 1844 in Bradninch. He died on December 19, 1846. Richard could not have been born that year. Why had his own brother made this error? The children who had "died in infancy of Croup" would most likely have been JAMES, THOMAS and ALFRED. The accidental death was of course JAMES THOMAS at Huntington in 1880. Frederick, Eliza and their children (Hattie, John and Cora) are buried in a lot in the Norwich Bridge Cemetery, Huntington, on the same road as Gateway Regional School. The cemetery is a large one, across the railroad tracks from the center. The gray tombstone can be seen from the road, looking just left of mid-center. Frederick's brother James Thomas Goodhind is also buried with them. With Cora’s death, Frederick Goodhind’s bloodline died out.